Make sure you have Chocolatey installed (which should be on every machine already. ?). I found this solution here. Rob This post was migrated from https://blogs.msdn.microsoft.com/rob/2016/12/23/convert-wav-files-to-flac/. 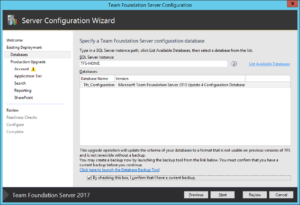 was running TFS 2013 Update 4 on top of SQL Server 2012 SP3 and was unable to upgrade to TFS 2017 because this version of the SQL database is not supported. 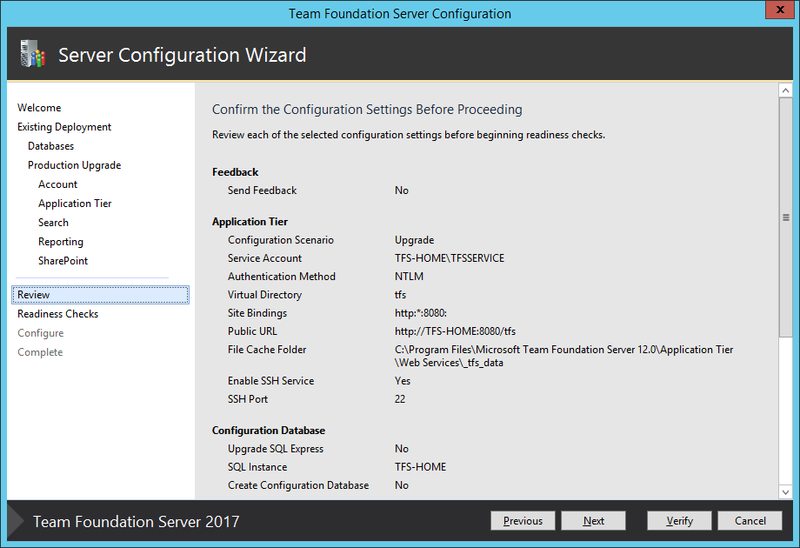 So, I ran the SQL Server 2016 installer from the ISO and used the SQL Upgrade tool. 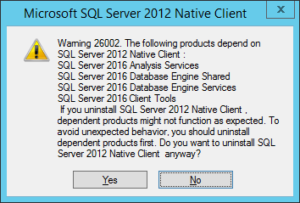 I then uninstalled SQL Server 2012 by double-clicking on the “Microsoft SQL Server 2012 (64-bit)” entry in Control Panel’s Programs and Features and selecting “Remove”. I clicked the “Select All” button, clicked the Next button, clicked the Next button, and lastly clicked the “Remove” button. This started the uninstall of SQL Server 2012. Then I installed TFS 2017 from the ISO and ran the Team Foundation Server Configuration Wizard. 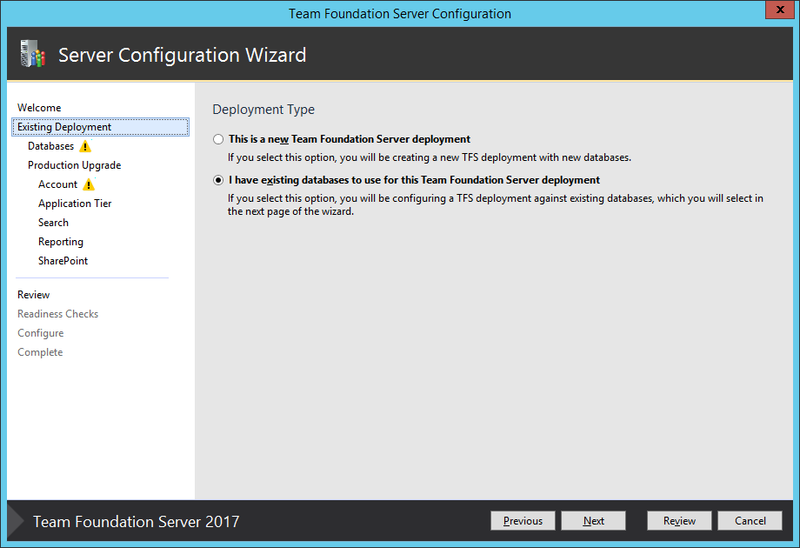 I selected “I have existing databases to use for this Team Foundation Server deployment” and clicked Next. 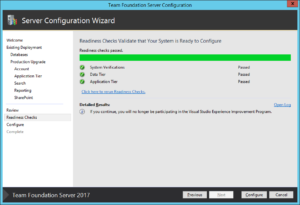 Then I selected my (only) SQL Server Instance, selected my (only) database, and checked the box stating that I have a current backup. Make sure you do before proceeding! I then clicked Next. Then I selected “Production Upgrade” and clicked Next. Then I entered the service account name under which the TFS Windows Service will run. Click the Test link to make sure you have the password correct before proceeding. Click Next. 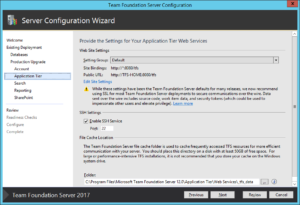 You may now wish to update your website settings to use SSL/TLS so that web-based connections to TFS are secure. I did not, so I accepted the existing values. You can also check the box to enable SSH (Secure Shell) connections to TFS; it was checked by default for me. You may also update the location of the File Cache used by TFS. Click Next. The next step allows you to enable Search across your repositories. It defaults to unchecked; I chose not to install it at this time. You can always install it later. Click Next. You may now configure reporting for TFS. 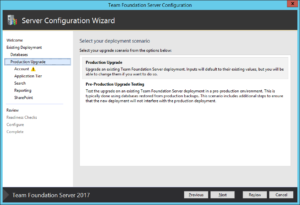 I didn’t have it installed before, so configuring it now was not an option. Click Next. 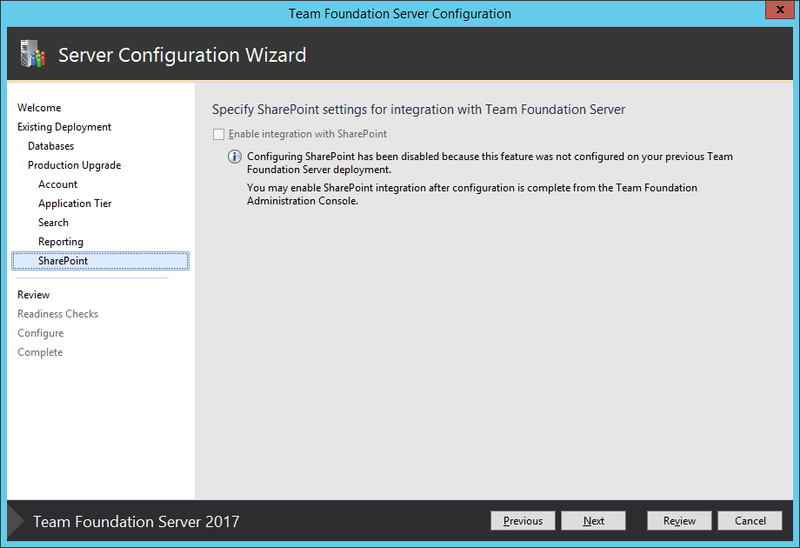 You may now configure SharePoint for TFS. I didn’t have it installed before, so configuring it now was not an option. Click Next. You are now presented with the Settings Confirmation page. You may click the Verify button or just click Next. I clicked Next. It will automatically run through the verification process. If everything verifies as successful, you will see a screen similar to the following. 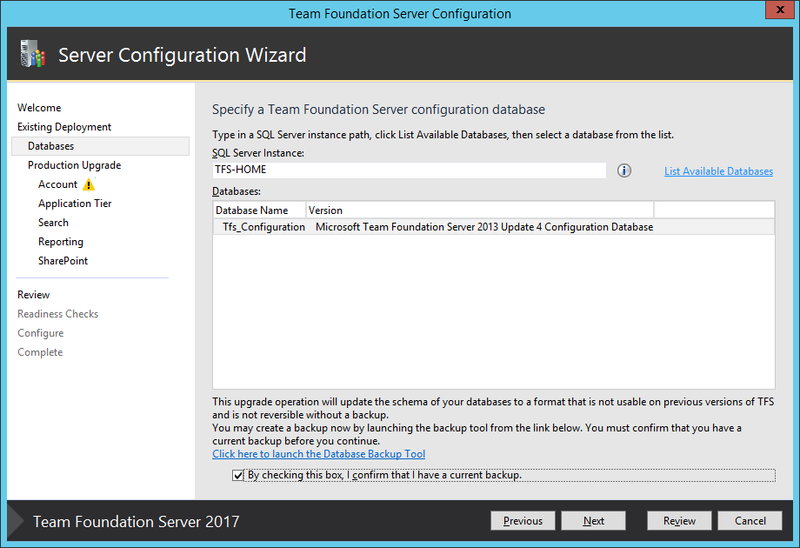 If all was successful, click Configure to Upgrade your previous installation of databases and TFS to 2017. 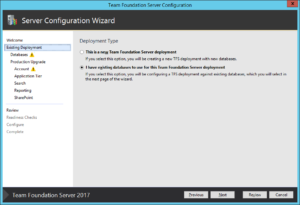 This post was migrated from https://blogs.msdn.microsoft.com/rob/2016/12/22/upgrading-from-tfs-2013-to-tfs-2017/. My coworker, Mark, asked me how I get eBooks onto my iPad today. I told him I had never read an eBook on my iPad and he said I needed to correct this. Since I store all of my eBooks in my OneDrive account and then manage them with calibre, I will sometimes just open PDFs from the caliber folder using the OneDrive iPad app and read them in Acrobat Reader on the iPad, but it seemed like there should be a better way to read eBooks. I also wanted a good way to read epub files on the iPad. Launch calibre on your PC/Mac. 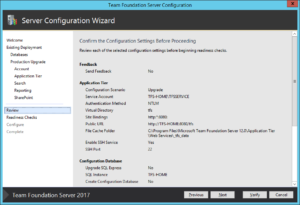 Turn on the Content Server by clicking the Connect/Share button and leave calibre running. You will see a list of books in Safari, just click on the epub link for whichever book you want to read, Safari will then prompt you to open it with iBooks. I had to click the Get button on the calibre web page for the specific book I wanted to transfer to open the book in iBooks. It seems like a lot of people do this with Handbrake. However, from my recent reading, it seems like the better option is to use VidCoder. I may update this post soon with further details as I try the software out. Note that you will need to replace my username (i.e. rob) in the path above with whatever account you are logged into in your Windows VM. &amp;amp; "C:\Users\rob\AppData\Roaming\Parallels\Shared Applications\Sublime Text (Mac).exe"
However, when I tried to pass a command-line parameter to this app, I couldn’t get it to work. I was trying to pass the file that I wanted to open in Sublime Text from the command line, but Sublime always opened to a blank document. Thanks to the fine folks at Parallels Support on Twitter, I got the solution: You must pass the full path to the file, not the relative path. It worked! This means that I don’t have to install apps that I already own on my Mac in my Windows VM, as well. This will save me from having to configure each of these apps twice. This makes setting up new VMs really easy as well since they will just leverage my Mac’s configured apps. Woohoo!